The TIR system is going paperless. The new eTIR system is based on real-time digital data exchange between transport operators, Customs authorities, TIR system guaranteeing organizations, and the United Nations. A pilot project is currently being implemented between Iran and Turkey, with the eTIR system expected to expand geographically from there over the coming years, reducing international transit costs and increasing security. The TIR system – an acronym for Transports Internationaux Routiers (International Road Transport) – is the only global transit system that allows goods to move from a Customs office of departure to a Customs office of destination in sealed load compartments, with harmonized and mutually recognized Customs controls and procedures, as well as an internationally valid guarantee. It facilitates trade and transport whilst preventing losses in the collection of Customs duties and taxes. The system is based on the United Nations (UN) TIR Convention, which, since it was first developed in the 1950s, is maintained by its Contracting Parties under the auspices of the UNECE. Since then, under the UN’s mandate, the IRU has managed the international guarantee chain, produced and distributed the iconic TIR carnets, and steadily developed information technology (IT) and administrative processes, thus ensuring the smooth functioning of this longstanding and successful public-private-partnership. Today, there are 69 Contracting Parties to the TIR Convention on four continents, and more countries in areas as diverse as Africa, Asia, the Middle East and South America are showing great interest in acceding to the Convention in the near future. For many years the multi-coloured paper carnets were the visual symbol of the TIR system. The TIR carnet is not only a standard Customs transit document, but also tangible proof of the international guarantee for duties and taxes for goods that are being transported under the TIR system. However, times and technology are changing. In order to provide transporters and Customs authorities with a better service, the TIR system had to become more competitive and efficient. 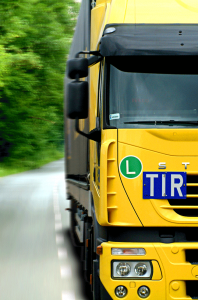 The IRU and UNECE, therefore, joined forces to completely computerize TIR procedures, with the signing of an agreement in March 2015 that also paved the way for the current eTIR pilot project between Iran and Turkey. Officially launched in October 2015, the pilot project has been led by the Iranian and Turkish Customs authorities, two pioneer volunteer transport operators, and the two countries’ respective TIR Guaranteeing Associations, namely the Iran Chamber of Commerce, Industries, Mines and Agriculture (ICCIMA) and the Union of Chambers and Commodity Exchanges of Turkey (TOBB), working together with the IRU and UNECE. 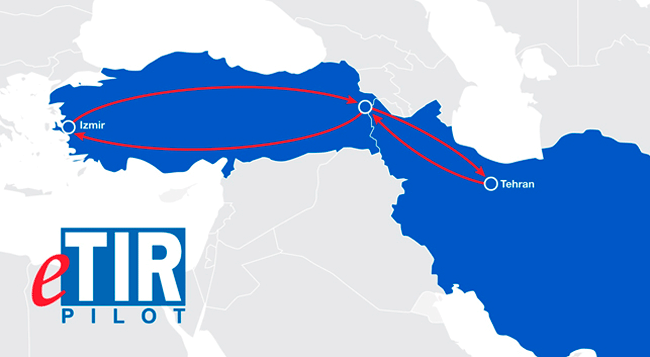 In November and December 2015, after the IT systems of all stakeholders were properly tested, eTIR pilot transports were successfully conducted between Teheran in Iran and Izmir in Turkey. The pilot transports crossed the Iranian-Turkish border post of Bazargan-Gurbulak in both directions, with digital information exchange fully replacing the usual paper-based procedures. The second phase of the pilot, which will involve additional Customs offices and transport companies, will commence in February 2016. During this phase, parties will test additional functionalities including an electronic payment facility to purchase electronic guarantees, as well as the use of electronic signatures. All stakeholders in the eTIR pilot have used dedicated, secure web-based applications and web services for the exchange of information. National associations use the ‘TIR Association Portal’ to issue electronic guarantees to transport operators, while transport operators use the ‘TIR Holder Portal’ to order e-guarantees and submit pre-declarations to Customs authorities. TIR data is sent from Customs administration IT systems to the IRU, and immediately replicated to the eTIR international system hosted by UNECE. Both the IRU and UNECE systems offer secure web services to Customs administrations to verify the validity of a given e-guarantee, as well as to obtain all data related to a transport covered by an e-guarantee. Most importantly, the eTIR was built in accordance with the provisions of the WCO SAFE Framework of Standards to Secure and Facilitate Global Trade, and is based on the WCO Data Model, more specifically on the TIR data set contained in the Data Model as a ‘Derived Information Package.’ The eTIR system gives all stakeholders real-time access to all relevant information, and allows the provision of advance cargo information (ACI), thus providing additional security and risk management benefits to all, while at the same time effectively decreasing the risk of fraud, accelerating Customs procedures, and significantly reducing costs. All parties involved have shown a high level of commitment and enthusiasm for the pilot project, and are looking forward to presenting their results to the TIR Administrative Committee, composed of all TIR Contracting Parties, to move the eTIR agenda forward. In parallel to ongoing efforts to develop the legal provisions for eTIR, which will either be included in the existing TIR Convention or form a separate protocol to the Convention, the pilot project between Iran and Turkey is a crucial stepping stone towards the development of a fully computerized global eTIR system. The content of this article does not necessarily reflect the official opinion of UNECE. Responsibility for the information and views expressed therein lies entirely with the authors.